Kimchi. You either love it or you hate it. Me, I love it! And thankfully my husband loves it too, which means I can make this awesome dish, and anything else with kimchi, whenever I want! It’s so good with korean barbecue, or korean barbecue burgers. 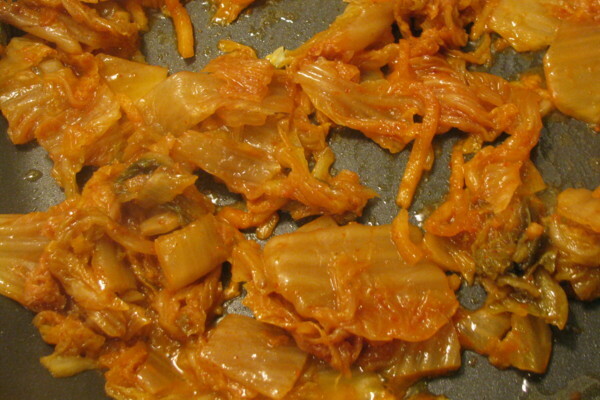 Kimchi is fermented vegetables, most typically cabbage. It’s a very traditional Korean side dish. A little vinegary, a little spicy, and quite red. I came across this recipe when I was browsing the Cook’s Illustrated website. I saw kimchi in the title and I had to try it. And good thing, because it’s a definite winner in my book! Stir-fries are quick meals, so they’re perfect for weeknight meals. While the beef marinates, you can cut up all the vegetables and mix the sauce. This works out perfectly so that everything is ready at the same time and you’ll be able move quickly once the stir-fry is on the stove. So if you like kimchi, or are interested in trying kimchi for the first time, this recipe is a must try. Note: The recipe calls for flank steak, but you can use any cut of meat as long as you cut it thinly and still cut the meat down to the size called for in the recipe. Cut beef with the grain into 2-inch wide strips, then slice across the grain into ⅛-inch-thick slices. If using beef other than flank steak, slice it into ½-inch slices, then cut into chunks about 2-inches by ⅛-inch. Combine 2 tablespoons soy sauce and 1 teaspoon sugar in medium bowl. Add beef, toss well, and marinate for at least 10 minutes or up to 1 hour, stirring once. Meanwhile, whisk remaining 2 tablespoons soy sauce, remaining tablespoon sugar, chicken broth, sesame oil, and cornstarch in medium bowl. Combine garlic, ginger, and 1 teaspoon oil in small bowl. Drain beef and discard liquid. Heat 1 teaspoon oil in 12-inch nonstick skillet over high heat until just smoking. It is recommended to cook the meat in smaller batches to allow it to brown quickly and not dry out or become tough. Therefore, add half of beef to skillet in single layer, breaking up any clumps. Cook, without stirring, for 1 minute, then stir and continue to cook until beef is browned, 1 to 2 minutes. Transfer beef to clean bowl. Heat 1 teaspoon oil in skillet and repeat with remaining beef. Rinse skillet clean and dry with paper towels. Add remaining tablespoon oil to now-empty skillet and heat until just smoking. Add kimchi and cook, stirring frequently, until aromatic, 1 to 2 minutes. Add bean sprouts and stir to combine. Push vegetables to sides of skillet to clear center; add garlic-ginger mixture to clearing and cook, mashing with spatula, until fragrant, 15 to 20 seconds. Stir to combine garlic-ginger mixture with vegetables. 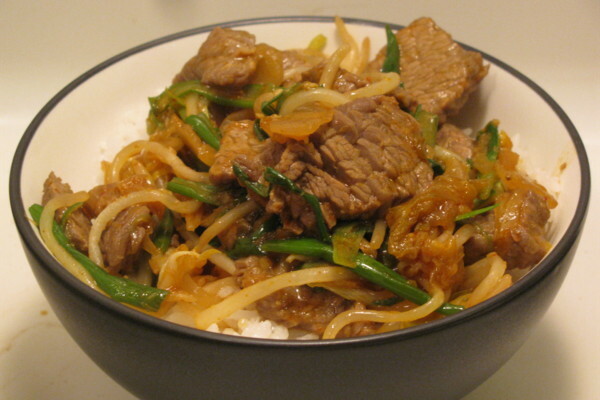 Return beef, any accumulated juices, and scallions to skillet and stir to combine. Whisk sauce to recombine, then add to skillet; cook, stirring constantly, until sauce is thickened and evenly distributed, about 30 seconds. Serve over rice.